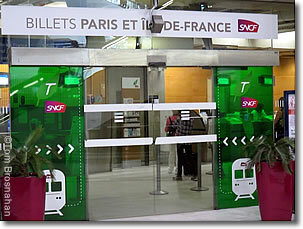 Here's how to buy RER suburban train tickets to go from Paris-Charles de Gaulle Airport to central Paris, from a ticket office or a ticket machine using cash euros or a credit or debit card. Basilique du Sacré- Coeur, Montmartre, Paris. 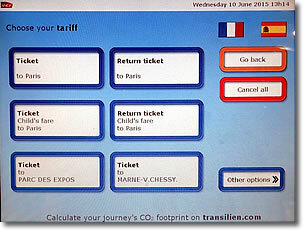 Here's how to buy train tickets to go from Paris-Charles de Gaulle Airport to central Paris on the RER Line B suburban train. Except for private transfer, which you book online before you arrive, you may need cash euros to pay for your ride to the city center. There are currency-exchange booths located prominently in the Arrivals and Baggage Claim areas, but ATMs (cash machines) are usually the thriftier option, with a better rate of exchange. ATMs are not as prominent, so you may have to search for one, but you'll save money. Ask or look for un distributeur de billets. There's one in Terminal 2E (Air France, Delta, SkyTeam) outside baggage claim near the Information booth, and another at the bank branch on Level 4 of Aérogare 2, the airport's main train station. From anywhere in the airport, follow signs reading Transports (Ground Transport), RER Trains, or Paris par train (Paris by Train). You will end up at Aérogare 2 (Train Station 2), CDG Airport's main SNCF and RER train station. An RER train ticket from CDG Airport to central Paris costs 10.30€, which you can purchase with euro coins and bills/notes, or with an accepted debit or credit card. You may wait in line at the ticket office and buy your ticket with cash euros or a debit or credit card, or you may buy your ticket from a ticket machine. You cannot buy a ticket on the train. You must have a ticket to access the train station and to exit the station at your destination. (See the photo on the right—>). 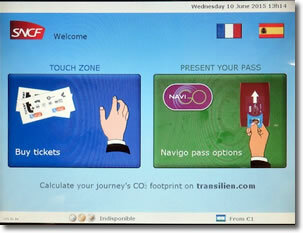 Wait in line and, if you're not going to buy a Navigo transit pass, ask for a ticket to Paris (un billet á Paris). The ticket agent will sell you a one-way/single ticket or round-trip/return ticket good for the RER Line B train all the way to central Paris. The ticket is also valid to continue your journey by Métro once you arrive in central Paris, so be sure to keep it! If you have sufficient euro coins, and/or bills/notes, or an accepted debit or credit card, you can buy your ticket from a ticket machine (see photo to right—>). The machines offer instructions in various languages, including English. 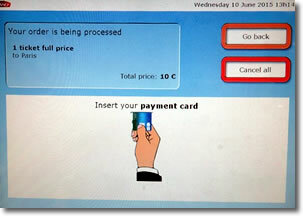 Check the instructions to assure the machine will accept the sort of payment you intend to provide. 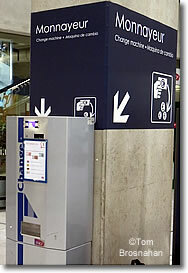 There are change-making machines (monnayeur) in Aérogare 2 that accept euro bills/ notes and give you euro coins in return. If you don't have euros nor a "smart" credit card, find a distributeur de billets (ATM/cash machine) and use your home bank card to withdraw some euro notes. There are several near the ticketing machines and one on Level 4 of Aérogare 2 at the bank branch. If this doesn't work, find an airport Bureau de Change (currency exchange office) and change some cash to euros. In Aérogare 2, look for signs reading vers Paris (To Paris), RER B, and voies 11 & 12 (tracks 11 & 12). Follow the signs to the turnstiles. 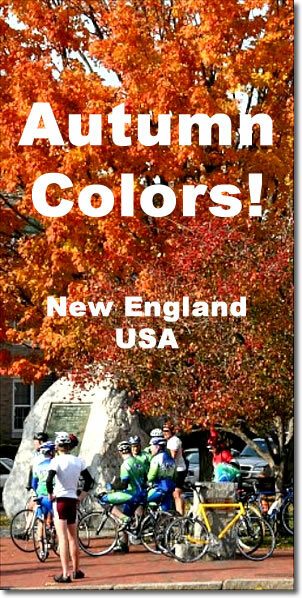 Here's the route you'll take (map). On the RER system, you must insert your ticket into the turnstile both to enter and to EXIT the system! 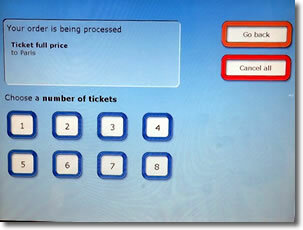 When you enter, insert your ticket, then take it from the pop-up slot atop the turnstile and keep it with you. At the end of your train journey, insert it into the turnstile to exit the RER system. Pass through the turnstile and descend to tracks 11 & 12. Here's a route map of the RER B train line. 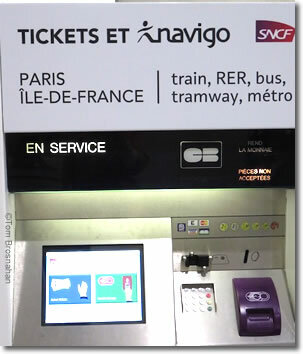 A ticket machine at Aérogare 2 for transport in Paris and vicinity (not for train tickets to other cities.) EN SERVICE means the machine is working.